Concealed carry holsters that are properly designed and crafted allow for quick access and use. The quality of your holster is of the utmost importance. Do not sacrifice your safety when it comes to the expense of a hand crafted holster. A properly constructed concealed holster should include a sweat shield and sturdy clips of belt loops. These holsters provide for easy concealment of your personal weapon while at the same time giving you the ability for quick access of your favorite sidearm. There are a variety of options available from inside the waist band (IWB) to outside the waist band (OWB) and even ankle carry and shoulder holster designs. 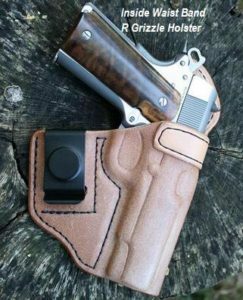 Arkansas concealed carry holsters are made for most modern firearms and come in custom colors and materials.